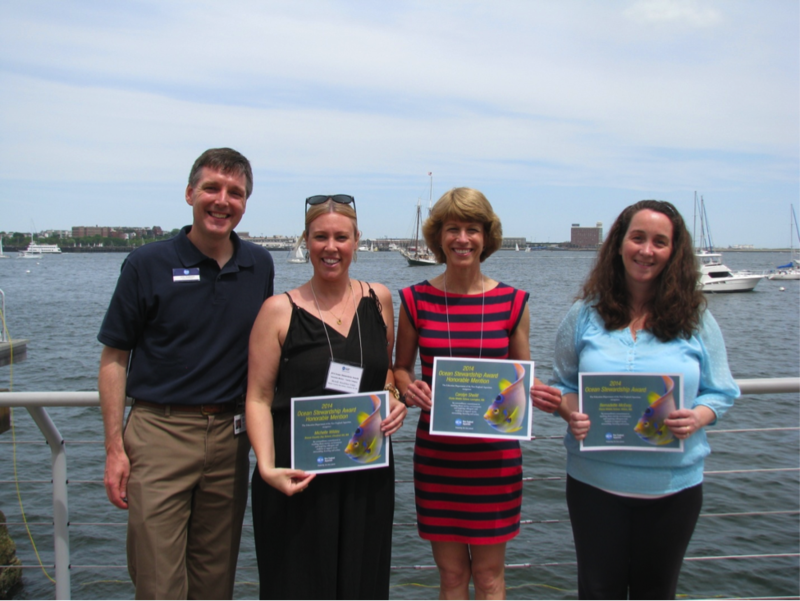 The Aquarium Education Department's Ocean Stewardship Awards are one of the ways our educators recognize teachers and schools who are working to promote an ethic of ocean conservation and who are taking concrete steps to help protect our blue planet. We received a record number of nominations and we were thrilled to hear about all the amazing work being done by both teachers and schools across New England. 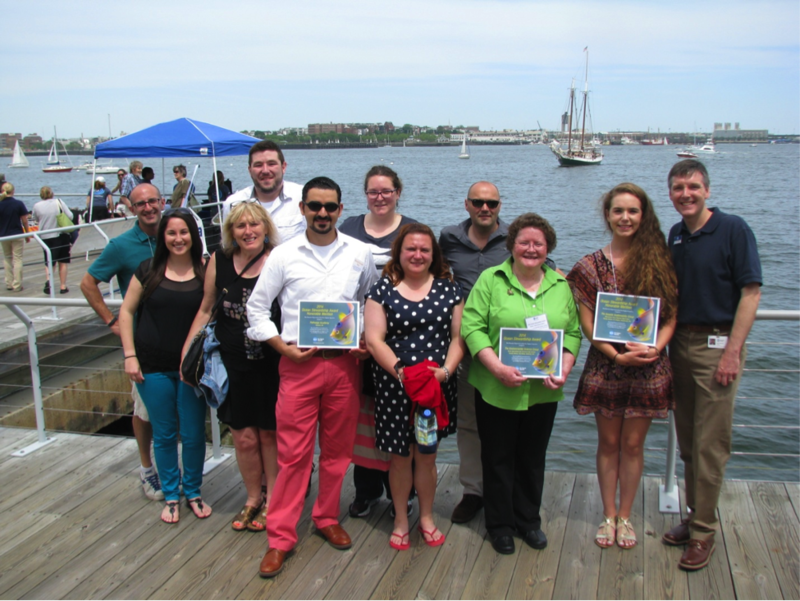 This year, we honored our winners at our World Oceans Day event on June 8. We would like to thank everyone who joined us for the celebration and to all those who took the time to complete a nomination. Community members who care about their local watershed, the ocean and the environment in general are what inspire Bernadette McEvoy to educate her students about ocean conservation. With passion, she teaches engaging lessons about the Neponset River Watershed and works hard to create authentic outdoor experiences for her students. Her many achievements include organizing the World Water Monitoring Day event. In collaboration with the MWRA and CH2MHill, she and her students annually test the water quality of Pine Tree Brook in Milton. In past years, she also worked in collaboration with the University of Massachusetts at Boston to develop a project in which students designed a swan probe to test the water quality of Turner's Pond in Milton. In addition to these projects, Bernadette is always open to sharing her experience and knowledge with colleagues and recently presented on ‘Watershed Wonders: Inspiring Environmental Stewardship’ at the National Science Teachers Association Convention in Boston. She also regularly encourages her students to raise awareness about our ocean by submitting artwork to the annual Massachusetts Marine Educators K-12 Marine Art Contest. Above all, Bernadette believes that students care when they are aware. She believes that the more she teaches about the ocean and environment, the more likely they will become environmental stewards for life. Carolyn continually inspires students to explore the ocean by creating tremendous learning opportunities both inside and outside her classroom. She arranges for scientists from the Woods Hole Oceanographic Institute (WHOI) to visit her classroom and plans much of her curriculum around the WHOI Dive and Discover website. Her class connects with the scientists on board the research vessel and devises scientific investigations based on the work being done on the ship. Her involvement with WHOI even provided her with an opportunity to sail with researchers and take a dive in the Alvin submarine – a trip she shared with all the students at Clarke Middle School when she addressed them from the ocean depths via the school's PA system. In addition to connecting her student with professional scientists, Carolyn arranges an annual field trip for all seventh graders to explore the rocky intertidal zone and its ecology at the Northeastern University Marine Science Research Center at Nahant. Furthermore, her love of the oceans has caused her to take a keen interest in teaching about the effects of global warming and she has devised a series of inquiry-based investigations to examine the effects of increased carbon dioxide levels on ocean acidity. Carolyn has even started an after-school Ocean Science Club to go beyond what she is able to teach in her classroom. Her passion for the ocean is tremendous. As a middle school science teacher at Beaver Country Day School, Michelle inspires her students every day to take action to protect our planet. Over the past ten years, she has created a rich marine biology curriculum, infusing her classroom with projects and labs that push her students to think critically about ocean conservation. Through her leadership, students become passionate about ocean issues and they help spread the word by creating projects to share with the school community, thereby educating others and inspiring more positive action. In her Global Ocean Issues Research Studio, her eighth graders work to research and create art projects, speeches, movies or websites to raise awareness about various topics including bycatch, sustainable seafood choices, and the destruction of coral reefs. But Michelle’s dedication is not contained to her classroom; she infuses the whole school with knowledge of ocean issues. She invites speakers to discuss plastics pollution and protection of sharks with the whole school and regularly takes students on trips to the New England Aquarium and Woods Hole, Mass., where they investigate animals and marine life. In addition, Michelle coordinates water data collection visits to the Charles River. Along with her passion and dedication to ocean issues, Michelle’s colleagues describe her as an amazing educator whose vivacious personality is infectious to all of her students. The goal of the Environmental Science program at Essex Agricultural and Technical High School is to equip students with the skills necessary to become future stewards of the environment. Students in this program participate in numerous efforts to raise environmental awareness in their community. They partake in certifying vernal pools in local areas and create trails in the nearby communities with a focus on educating the public of important environmental issues. They raise red-bellied cooters and salmon to be released back into the environment. They collect and analyze water quality data from a local river as well as identify and conduct a wildlife population census. Students also plan, prepare and execute a field trip to Canada to learn about Canadian fisheries and obtain certification as Environmental Interpretive Guides through the National Association of Interpreters (NAI). Through this work, students become ambassadors of the environment, and take that leadership role seriously. In addition to the many program-designated projects, students regularly develop their own initiatives. For example, several students recently paved the way to a lunchtime recycling program and created an awareness campaign about the harmful effects of improperly disposed medications into our water system. The Environmental Science program offers a hands-on curriculum that sparks passion for the environment and inspires the next generation of ocean stewards. The students and staff at Pathways Academy wanted to take action to keep their local areas clean so they decided to create ‘Pathways Pick-Up’ – a project whereby recyclable materials and batteries are gathered and dropped off at specified locations. But, what started as one project led to a cultural shift at the school shown by a campus-wide sustainability initiative whereby ‘throw-away’ plastic and paper products were replaced with reusable products made from recycled materials. Furthermore, in an effort to keep items from landfills and the ocean, the students at Pathways Academy regularly use ‘found’ items, such as broken keyboard keys, discarded sports equipment, and used cardboard boxes, in art projects. Green is now a way of life at Pathways Academy. Not only do these initiatives help protect the environment and ocean, they also positively impact the students at Pathways Academy, a school for students with Asperger’s Syndrome and related disorders. Through ‘Pathways Pick-Up’ and the ‘found items’ projects, students practice pragmatics skills. Most importantly, students at Pathways are learning to appreciate the land and ocean that surrounds us. They are learning how to become responsible members of a great community and are constantly seeking new ways to support healthy environments. The Seaside Sustainability Group is a division of the Manchester Essex Regional High School Green Team and is led by a group of concerned and active students from the Cape Ann area who serve to educate and promote awareness on our oceans’ impact and role in society. The program aims to increase environmental stewardship, teach civic responsibility and nurture a passion for sustainable living practices. From ocean acidification and plastic pollution to sea level rise and invasive species, students in the group learn about many challenges facing our ocean. With this knowledge, they work to raise awareness in local areas and give community members the tools and knowledge to effectively preserve our ocean and local aquatic ecosystems. In the future, the Seaside Sustainability Group hopes to develop as a group and acquire a boat in an effort to reach a broader range of people. With their work, they hope to serve as a model of sustainability through innovative local actions working towards finding solutions to environmental challenges. They value all that the ocean gives to us and are working hard to preserve its beauty and health. Learn about past Ocean Stewardship Award winners here. Nomination period for the 2015 Awards will open in November 2014. Check back here for more information.